Evidence suggests that both the migration and activation of neutrophils into the airway is of importance in pathological conditions such as pulmonary emphysema. In the present study, we describe in vivo models of lung neutrophil infiltration and activation in mice and hamsters. BALB/c and C57BL/6 mice were intranasally treated with lipopolysaccharide (0.3 mg/kg). Twenty-four hours after, animals were treated intranasally with N-Formyl-Met-Leu-Phe (0 to 5 mg/kg). Golden Syrian hamsters were treated intratracheally with 0.5 mg/kg of lipopolysaccharide. Twenty-four hours after, animals were treated intratracheally with 0.25 mg/kg of N-Formyl-Met-Leu-Phe. Both mice and hamster were sacrificed two hours after the N-Formyl-Met-Leu-Phe application. In both BALB/c and C57BL/6 mice, a neutrophil infiltration was observed after the sequential application of lipopolysaccharide and N-Formyl-Met-Leu-Phe. However, 5 times less neutrophil was found in C57BL/6 mice when compared to BALB/c mice. This was reflected in the neutrophil activation parameters measured (myeloperoxidase and elastase activities). Despite the presence of neutrophil and their activation status, no lung haemorrhage could be detected in both strains of mice. When compared with mice, the lung inflammation induced by the sequential application of lipopolysaccharide and N-Formyl-Met-Leu-Phe was much greater in the hamster. In parallel with this lung inflammation, a significant lung haemorrhage was also observed. Both mouse and hamster can be used for pharmacological studies of new drugs or other therapeutics agents that aimed to interfere with neutrophil activation. However, only the hamster model seems to be suitable for studying the haemorrhagic lung injury process. Several lines of evidences suggest that elastase may play an important role in certain pathological conditions such as pulmonary emphysema . Neutrophils could be implicated in the development of emphysema because they are the major source of enzymes with elastolytic activity in the lung . Nevertheless, alveolar neutrophilia is not a prerequisite for the development of pulmonary emphysema since in airway diseases like asthma, acute respiratory distress syndrome and cystic fibrosis an increased number in bronchoalveolar lavage neutrophils is observed without any air space enlargement. These observations suggest that the activation of neutrophils migrating into the airway (e.g. release of elastase) is of importance in lung destruction . Therefore the purpose of this study was to set up an in vivo model in which the neutrophil migration and activation into the lung could be studied. Lipopolysaccharide (LPS) is a macromolecular cell surface antigen of bacteria which, when applied in vivo triggers a network of inflammatory responses. One of the primary events is the activation of mononuclear phagocytes through a receptor-mediated process, leading to the release of a number of cytokines, including tumor necrosis factor-α (TNF-α) . In turn, the increased adherence of neutrophils to endothelial cell induced by TNF-α leads to a massive infiltration in the pulmonary space . Although LPS-induced lung inflammation has been used mainly as an acute respiratory distress syndrome model, the main characteristics of this model, macrophage activation, TNF-α production and neutrophil infiltration and activation, are also features of chronic obstructive pulmonary diseases. Intraperitonial  and intravenous  injections of bacterial LPS are the most common administration used to develop acute lung injury in animal models. Using these methods of administration pulmonary lung inflammation can be measured by albumin extravasation or neutrophil myeloperoxidase activity in the lung parenchyma [6, 7]. The drawback of these models is that neutrophils do not infiltrate into the lung parenchyma. Although these models are very useful to unravel the mechanisms of neutrophil trafficking and/or TNF-α production, there are not suitable to measure lung neutrophil activation. Intranasal administration of LPS in mice have been reported to induce bronchoalveolar lavage neutrophil influx and lung damage as measure by bronchoalveolar lavage haemorrhage . However, only a small increase in bronchoalveolar lavage haemoglobin content was reported (2 times) which suggest that this model might not be suitable for compound screening. N-formyl-methionyl-leucyl-phenylalaline (fMLP) is a powerful activator of both neutrophils and macrophages. The main response elicited by fMLP is the generation of reactive oxygen species and the release of lysosomal enzymes such as myeloperoxidase and elastase . In this report, we describe a model of neutrophil activation in vivo using either BALB/c or C57BL/6 mice and Golden Syrian hamsters and show that although BALB/C mice and Golden Syrian hamsters can be used to study neutrophil activation, only the hamster seems to be suitable for studying the haemorrhagic lung injury process. A dose dependent increase in bronchoalveolar lavage neutrophil numbers and total cell count, associated with a dose-dependent decrease in macrophage numbers, was observed as early as 3 h after the LPS challenge (Fig. 1). An increase in lymphocyte numbers was observed only with 0.3 mg/kg of LPS. There were no eosinophils in the PBS-challenged mice and LPS did not induced any increase in this cell type (data not shown). Bronchoalveolar cellular infiltration 3 and 24 hours after the LPS challenge in BALB/c mice. Animals were intranasally challenged with increasing concentrations of LPS (0.05 to 0.3 mg/kg) or PBS alone (50 μl). Three or 24 hours after the challenge, animals were sacrificed and bronchoalveolar lavage performed. Data are expressed as mean ± SEM from two different experiments each included 6 mice per group. Significance (P < 0.050, versus PBS challenged mice, is indicated by *. Neutro: neutrophils; Macro: macrophages; Lympho: lymphocytes; TCC: total cell counts. When compared with the 3 h time point, a similar pattern of response was observed at 24 h post LPS challenge (dose dependent increase in neutrophil, total cell count and lymphocyte and no effect on eosinophils). However, the magnitude of the inflammation was about twice as much. In contrast, the macrophage number did not vary (Fig. 1). LPS-induced a dose dependent increase in the levels of TNF-α at the 3 h time point (Table 1) and no TNF-α could be detected at the 24 h time point (data not shown). Levels of bronchoalveolar lavage myeloperoxidase (MPO) activity, elastase activity and TNF-α following LPS challenge in BALB/c mice. At 3 h post LPS challenge, the myeloperoxidase activity was significantly increased only with the highest dose (0.3 mg/kg). In contrast, 24 h after LPS challenge, all the doses used (0.05 to 0.3 mg/kg) induced a significant increase in bronchoalveolar lavage myeloperoxidase activity (Table 1). No elastase activity could be detected in the bronchoalveolar lavage at the 3 hours time point (data not shown). However, 24 h after LPS a dose-dependent increase in the bronchoalveolar lavage elastase activity was observed (Table 1). At both time points, no bronchoalveolar lavage haemorrhage could be measured (data not shown). In a separate experiment, BALB/c mice were challenged with 0.3, 0.5 or 1 mg/kg of LPS and sacrificed 24 hours after. As shown in table 2, when compared with 0.3 mg/kg of LPS, neither the neutrophil infiltration nor their activation (MPO and elasatase levels) were further increase. For all doses of LPS no bronchoalveolar lavage haemorrhage could be measured (data not shown). Bronchoalveolar lavage inflammation in BALB/c mice 24 hours after the challenge with 0.3, 0.5 or 1 mg/kg of LPS. Animals were intranasally challenged with 0.3, 0.5 or 1 mg/kg of LPS or PBS alone (50 μl). Twenty four hours after the challenge, animals were sacrificed and bronchoalveolar lavage performed. Data are expressed as mean ± SEM 6 mice per group. Significance, (P < 0.05) indicated by (*) is versus PBS-challenged mice. 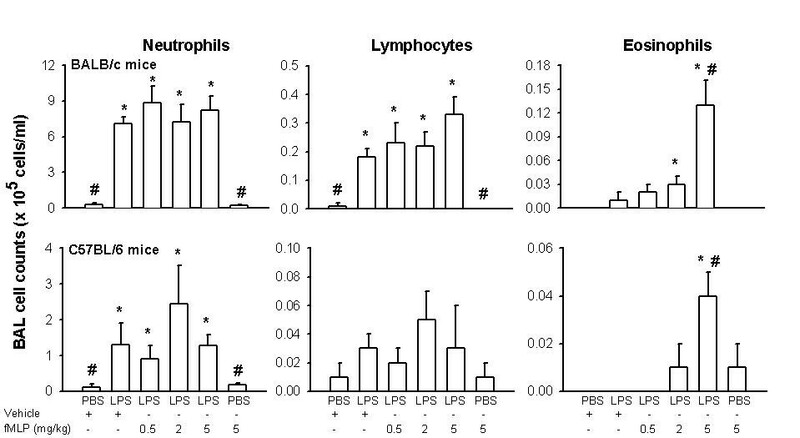 In agreement with the results above, when compared with PBS-challenged BALB/c mice, LPS induce an increase of neutrophils and lymphocytes in the bronchoalveolar lavage at the 24 hours time point (Fig. 2). In C57BL/6 mice, neutrophils were the only cell types increase after LPS (Fig. 2). Moreover, about 6 times less neutrophils were found in the bronchoalveolar lavage from C57BL/6 mice when compared to BALB/c mice. Bronchoalveolar differential cell counts following sequential application of LPS and fMLP in BALB/c and C57BL/6 mice. Animals were intranasally challenged with LPS (0.3 mg/kg intranasally) or PBS (50 μl). Twenty four hours after the challenge, mice were intranasally challenged with increasing concentrations of fMLP (0.5–5 mg/kg) or 50 μl of vehicle (1% DMSO in PBS). Two hours after the second challenge, animals were sacrificed and bronchoalveolar lavage performed. Data are expressed as mean ± SEM from 5–9 mice per groups. Significance (P < 0.05), indicated by (*) or (#) is versus PBS-challenged/Vehicle-treated mice and LPS-challenged/Vehicle-treated mice, respectively. When added for 2 h, 24 h after the LPS, fMLP-induced a dose-dependent increase in bronchoalveolar lavage eosinophils, which was significant for the highest dose used (5 mg/kg). The influx of the others cell types, including macrophages (data not shown), were not affected by the addition of fMLP (Fig. 2). In both strains of mice, fMLP, on his own at 5 mg/kg, had no effect on the bronchoalveolar lavage cellular content (Fig. 2). In BALB/c mice, LPS-induced an increase in myeloperoxidase activity, and this activity was further increased, in a dose dependent manner, by fMLP (Fig. 3). However a significant increase, when compared with LPS-treated mice, was observed only at the highest dose of fMLP, 5 mg/kg (Fig. 3). fMLP on his own, at 5 mg/kg, induce a significant increase in the myeloperoxidase activity, when compared with PBS/Vehicle treated mice. This probably reflects the activation of the small population of neutrophils present after the PBS application (Table 1). In C57BL/6 mice, LPS application did not induce an increase in the myeloperoxidase activity when compared with PBS treated mice. A dose response to fMLP, following LPS, was observed and a significant increase over the LPS-treated group was obtained from 2 mg/kg of fMLP (Fig. 3). For both strains of mice, in the PBS/Vehicle treated mice, very low levels of myeloperoxidase activity could be detected in the bronchoalveolar lavage (Fig. 3). Bronchoalveolar lavage activities for myeloperoxidase (MPO) and elastase activities in BALB/c and C57BL/6 mice following the sequential application of LPS and fMLP. Animals were intranasally challenged with LPS (0.3 mg/kg) or PBS alone (50 μl). Twenty four hours after the provocation, increasing concentrations of fMLP (0.5 to 5 mg/kg) or 50 μl of vehicle (PBS, 1% DMSO) were applied intranasally. Two hours after the second challenge, animals were sacrificed and bronchoalveolar lavage performed. Data are expressed as mean ± SEM from two different experiments each included 5–9 mice per group. Significance (P < 0.05), indicated by (*) or (#) is versus PBS-challenged/Vehicle-treated mice and LPS-challenged/Vehicle-treated mice, respectively. In BALB/c mice, LPS induce an increase in the bronchoalveolar lavage elastase activity, and this activity was further increased, in a dose dependent manner, by fMLP. A significant increase, when compared with LPS-treated mice was observed only at the highest dose of fMLP. fMLP alone, at 5 mg/kg, had no effect on the bronchoalveolar lavage elastase content (Fig. 3). In C57BL/6 mice, LPS application did not induce an increase in the elastase activity when compared with PBS treated mice. fMLP induce a dose dependent increase in the bronchoalveolar lavage elastase activity and a significant increase, when compared with LPS-treated mice, was observed only at the highest dose of fMLP (Fig. 3). In the PBS/Vehicle treated mice, no elastase activity could be detected in the bronchoalveolar lavage of both strains of mice (Fig. 3). Despite the presence of myeloperoxidase and elastase activity in the bronchoalveolar lavage, in both strains of mice, no bronchoalveolar lavage haemorrhage was evident (data not shown). As seen in the mice, LPS application results in a neutrophil infiltration into the bronchoalveolar lavage of the hamster (Fig. 4). When added 24 h after the LPS, fMLP (0.25 mg/kg) induce a significant increase in bronchoalveolar lavage eosinophils and lymphocytes. The influx of the others cell types, including macrophages (data not shown), were not affected (Fig. 4). Concomitant with the neutrophil influx induced by LPS, myeloperoxidase and elastase activities were also present in the bronchoalveolar lavage. 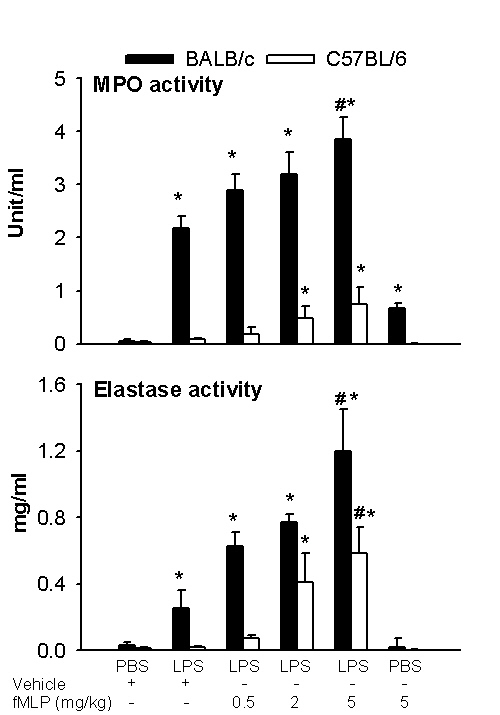 This activities were further increase (about 4 and 10 times for myeloperoxidase and elastase respectively) following fMLP (Fig. 5). In contrast to the results observed in mice, bronchoalveolar lavage hemorrhage was evident in the hamster after LPS treatment and the hemorrhage was further increase by the addition of fMLP (Fig. 5). Bronchoalveolar differential cell counts following sequential application of LPS and fMLP in hamsters. Animals were intratracheally challenged with LPS (0.5 mg/kg intratracheally) or PBS (100 μl). Twenty four hours after, hamsters were intratracheally challenged with 0.25 mg/kg of fMLP or 100 μl of vehicle (1% DMSO in PBS). Two hours after the second challenge, animals were sacrificed and bronchoalveolar lavage performed. Data are expressed as mean ± SEM from 5–6 hamsters per group. Significance (P < 0.05), indicated by (*) or (#) is versus PBS-challenged/Vehicle-treated hamsters and LPS-challenged/Vehicle-treated hamsters, respectively. Bronchoalveolar lavage levels for myeloperoxidase (MPO) activity, elastase activity and haemoglobin levels in hamsters following the sequential application of LPS and fMLP. Animals were intratracheally challenged with LPS (0.5 mg/kg) or 100 μl of PBS. Twenty four hours after, fMLP (0.25 mg/kg) or 100 μl of vehicle (Veh, 1%DMSO in PBS) was applied intratracheally. Animals were sacrificed two hours after the second challenge and bronchoalveolar lavage performed. Data are expressed as mean ± SEM from 2 different experiments each included 5–10 animals per group. Significance (P < 0.05), indicated by (*) or (#) is versus PBS-challenged/Vehicle-treated hamsters and LPS/Vehicle treated hamsters, respectively. The present study shows that the in vivo intranasal administration of LPS in BALB/c mice induced a dose- and time-dependent invasion of the airway lumen with neutrophils. The chronology of this inflammatory response in the lung was evaluated by the analysis of inflammatory cell count in the bronchoalveolar lavage, reflecting their extravasation from the vascular lumen to the airway airspace, and by the measurement of myeloperoxidase and elastase activities in the bronchoalveolar lavage reflecting the activation of neutrophils. It has been shown, in mice, that an increase in neutrophil proteases activity do not neceserally translate into lung damages . Therefore, we also meassured lung haemorrage as a possible surrogate marker of the lung destruction process. In BALB/c mice, examination of varying the concentrations of LPS clearly indicates a dose-dependent neutrophilic lung infiltration. A dose of 0.3 mg/kg of LPS instilled into the lung induces the optimal acute pulmonary inflammation since no further increase in neutrophil numbers and activation could be observed at doses of 0.5 and 1 mg/kg. The results obtained from the time course experiment clearly showed that an acute neutrophilia could be achieved as soon as 3 hours after the LPS challenge. However, in order to measure a reasonable activation of the infiltrating neutrophils the 24 hours time point post challenge is needed. After 5 days, the neutrophils in the bronchoalveolar lavage return to baseline levels and the mice recovered on their own from the induced trauma (data not shown). These results shown that intranasal administration of low amount of LPS in BALB/c mice results in an acute and well controlled pulmonary neutrophilia. Apart from the massive influx of neutrophils, which represent about 90–95% of the total cells in the bronchoalveolar lavage, a small but significant increase in lymphocytes was also observed.. Macrophages did not increase in a significant manner after LPS. In contrast, a significant decrease was observed following LPS challenge only at the earlier time point (3 hours). This observation, in agreement with a previous report , probably reflects macrophages adherence to the alveolar surface. Infiltrating neutrophils were also activated after the LPS challenge as evidenced by the increase levels of MPO and elastase activities. However, despite the massive neutrophil influx into the airway space of BALB/c mice and their activation status, no bronchoalveolar lavage haemorrhage was evident. Therefore, another model of lung neutrophil infiltration and activation was studied. fMLP has been shown to exaggerate the increase in airway resistance induced by LPS in anaesthetized guinea pigs . Similarly, ex vivo experiments have shown that fMLP increased vasoconstriction and edema formation in lungs from endotoxin-primed rats . Based on these observations, we speculated that the sequential intranasal administration of LPS and fMLP, 24 hours apart, might increase the neutrophil activation and therefore increase the haemorrhagic lung injury. In this model, we have compared BALB/c and C57BL/6 mice, the latter being described as a strain deficient in α1-proteinase inhibitor , with the idea that C57BL/6 will present more serious lung haemorrhage. Interestingly enough, while a good and reproducible LPS-induced inflammation was observed in the BALB/c, only a small neutrophilic influx was induced in C57BL/6. The reason for this is unknown, however it is well known that inbred mouse strains varied in sensitivity to different stimuli [13, 14]. Because C57BL/6 mice were poor responder to LPS, we went on to modify a procedure describing a model of neutrophil-induced lung damages in Golden Syrian hamsters, another species deficient in α1-proteinase inhibitor . In both strains of mice and in hamsters, the application of fMLP 24 h after LPS induced a small but significant increased in eosinophil numbers in the bronchoalveolar lavage, this is in accordance with the properties of fMLP which has been described as a chemoattractant for eosinophils . It is somewhat surprising that no further increase in neutrophil numbers was observed after the addition of fMLP since this peptides has been described as a powerful neutrophil chemoattractant when given intratracheally in mice . However, in this report the earlier time point studied was 24 hours post challenge , whereas in the present study, animals were sacrificed 2 hours after the fMLP challenge. Moreover, in our case fMLP was applied into the airway of animals which have been previously treated with LPS and the chemoattractant activity of fMLP could have been masked by the ongoing neutrophilic inflammation. In both strains of mice, fMLP-induce a dose-dependent increase in the resident neutrophil activation, as measured by bronchoalveolar lavage myeloperoxidase and elastase activities. However, none of the strains seems to develop lung haemorrhage. Although, BALB/c mice seems to be better than C57BL/6 for studying the neutrophil infiltration and activation processes following LPS application in vivo, none of these strains seems to be suitable for studying the haemorrhagic lung injury process. In hamsters, when compared with mice, the extent of the lung inflammatory cells infiltration induced by the sequential application of LPS and fMLP was much greater and the influx of neutrophils was followed by the development of haemorrhagic lung injury. The difference in susceptibility of BALB/C mice and hamsters to the development of haemorrhagic lung injury after fMLP instillation could be explained by the fact that hamsters are deficient in α1-proteinase inhibitor . This is supported by the observation that, although the bronchoalveolar lavage neutrophilia is much more pronounced in the hamsters following LPS instillation, these cells seem to be less responsive to fMLP. Indeed, similar levels of bronchoalveolar lavage myeloperoxidase activity were measured in BALB/c and hamsters following the sequential application of LPS and fMLP. Moreover, the bronchoalveolar lavage elastase activity was even less in the hamsters when compared with BALB/c mice. We have developed acute models of lung neutrophilic influx and activation in both mice and hamsters. Both species can be used for pharmacological studies of new drugs or other therapeutics agents that aimed to interfere with neutrophil infiltration and activation. However, only the hamster model seems to be suitable for studying the haemorrhagic lung injury process. The animals, purchased from Harlan (Oxon, U.K.), were housed in plastic cages in air-conditioned room at 22°C in a 12 hours light-dark cycle. Food and water were available ad libitum, The studies reported here conformed to the U.K. Animals (scientific procedures) Act 1986. Female BALB/c mice (20–25 g, 5–6 weeks) were treated intranasally, under Halothane/oxygen/nitrous oxide anaesthesia, with increasing concentration of LPS (Salmonella Typhosa, Sigma, Poole, U.K.) in 50 μl of sterile phosphate buffered saline (PBS) or with sterile PBS alone. Three or 24 hours after the provocation, terminal anaesthesia was induced with pentobarbitone sodium (60 mg/kg, i.p.). Female C57BL/6 and BALB/c mice (20–25 g, 5–6 weeks) were treated intranasally, under Halothane/oxygen/nitrous oxide anaesthesia, with 0.3 mg/kg of LPS (Salmonella Typhosa, Sigma, Poole, U.K.) in 50 μl of sterile PBS or with sterile PBS alone. Twenty-four hours after, animals were treated intranasally with increasing concentrations of N-Formyl-Met-Leu-Phe (fMLP, 0.5 to 5 mg/kg) or 50 μl of the vehicle (1% DMSO in PBS). For the Golden Syrian hamsters, a procedure modified from  was used. Male hamsters (90–100 g, 8–9 weeks) were treated intratracheally, under Halothane/oxygen/nitrous oxide anaesthesia, with 0.5 mg/kg of LPS (Salmonella Typhosa, Sigma, Poole, U.K.) in 100 μl of sterile PBS or with sterile PBS alone. Twenty-four hours after, animals were treated intratracheally with 0.25 mg/kg of fMLP or 100 μl of the vehicle (1% DMSO in PBS). Both mice and hamster were sacrificed two hours after the fMLP application. Once the animal anaesthetised, the abdominal cavity was opened and the animal exsanguinated by withdrawal of blood from a major vessel. The trachea was cannulated and bronchoalveolar lavage was performed by injecting 4 times the estimated tidal volume, 0.3 ml for mice and 1 ml for hamsters, of PBS into the lung via the trachea. The fluid was then immediately withdrawn and the cell suspension stored on ice. The recovery from lavage was comparable between species: 83.3 ± 6.8, 79.5 ± 8.5 and 80.6 ± 5.4 % for BALB/c, C57BL6 and Golden Syrian hamsters, respectively. Total cell counts were measured and cytospin preparation prepared (Shandon Scientific Ltd, Cheshire, UK). Cells were stained with Dif-Quik (Baxter Dade AG, Dudingen, Switzerland) and a differential count of 200 cells (mice) or 500 cells (hamsters) was performed using standard morphological criteria. The remaining lavage fluids were centrifuged at 400 × g for 10 minutes, the supernatant was aliquoted and either used immediately or stored at -80°C. bronchoalveolar lavage myeloperoxidase activity was measured on fresh bronchoalveolar lavage supernatant using a 96 well plate format colorometric assay modified from . Fifty μl of the samples, in duplicate, were mixed with 100 μl of the substrate buffer for 5 minutes at room temperature (sodium phosphate 50 mM, pH 6.0 containing, 0.5 % hexadecyltrimethylammonium bromide, 0.167 nM O-dianiside dihydrochloride and 0.4 mM H2O2). The reaction was stopped with 100 μl of 5 % sodium azide in distilled water and the OD read at 450 nm. Results were expressed as U/ml using a standard curve establish with human leukocyte myeloperoxidase (Sigma, Poole, U.K.). Elastase activity in the bronchoalveolar lavage supernatant was measured using a fluorogenic substrate highly specific for neutrophil elastase, Me-Suc-Ala-Ala-Pro-Val-MCA. Activity present in the bronchoalveolar lavage fluid was measured fluorimetrically in white maxisorb fluoronunc plates (Life Technologies, UK). 10 μl of cell supernatant, total cell lysate or bronchoalveolar lavage fluid was incubated at 37°C with 90 μl of MCA substrate solution (0.1 mM in 0.05 M Tris, 0.5 M NaCl, 0.01 M CaCl2, pH 7.5, 10% DMSO). The reaction is continuous and plates can be read as soon as 10 min after addition of the substrate. For samples with low elastase content, the plates were read again after 2–4 h, storing the plates in the dark at room temperature. The cleavage of substrate (increase in fluorescence of the liberated 4-methyl-7-coumarin) was measured using a fluorometer set at 370 nm excitation and 460 nm emission. 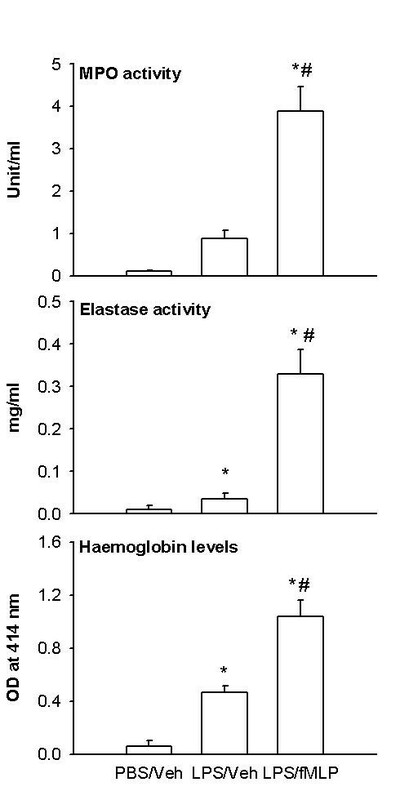 Elastase activity in supernatants was calculated based on the results from serial dilutions of standard human neutrophil elastase (Sigma, Poole, U.K.). TNF-α levels were measured on bronchoalveolar lavage supernatant using a commercially available ELISA kit (Genzyme Immunobiologicals, Cambridge, UK). The detection limit of this assay was determined to be 15 pg/ml. The elastase activity and TNF-α levels in the bronchoalveolar lavage were measured on fresh samples or samples stored at -80°C without any loss of activity for up to a month. Bronchoalveolar lavage haemorrhage was measured on fresh samples. Erythrocytes in the bronchoalveolar lavage pellet were lysed by adding distilled water for 30 seconds followed by addition of 2 times concentrated PBS (vol./vol.). Tubes were then centrifuged at 400 × g for 10 minutes and haemoglobin content assessed, in the supernatant, by optical density measurement at 414 nm. Data are expressed as mean ± s.e. means (SEM). Statistical comparisons were performed using a Kruskall-Wallis test with Bonferroni correction for multiple comparison and a P value of less than 0.05 was considered significant.